Bug fixes, updates, a new line spacing feature and some more keyboard shortcuts. There's a new line spacing feature in the text properties panel - tap on some text and the properties panel will slide in on the right. The Line spacing panel itself expands with a tap to reveal options for adjusting space both above and below a paragraph. Line spacing is a paragraph attribute - it will affect the paragraph in which the text cursor is placed. 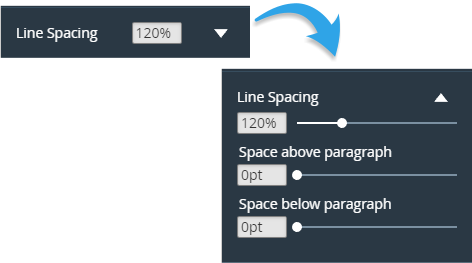 You can enter a fixed value (pts or px for example) for the line spacing - but it is usually better to enter a percentage value as this will cope better should you need to make changes to font size. Use the space above and below paragraph as a more controlled alternative to the usual double return method for paragraph spacing. We have upated our keyboard shortcuts with a fuller list both for Windows and macOS. Check them out here. New SVG (scalable vector graphics) import and export - open and download a page as an SVG file. Watch this space - details following shortly.